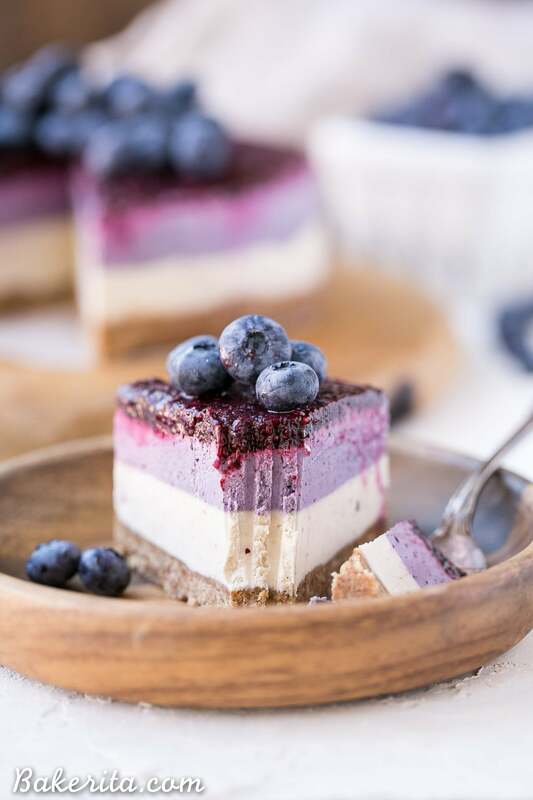 This No-Bake Layered Blueberry Cheesecake is a beautiful and easy-to-make Paleo-friendly + vegan cheesecake made with soaked cashews! The cheesecake layers are lusciously smooth and creamy with a tart, fruity topping. 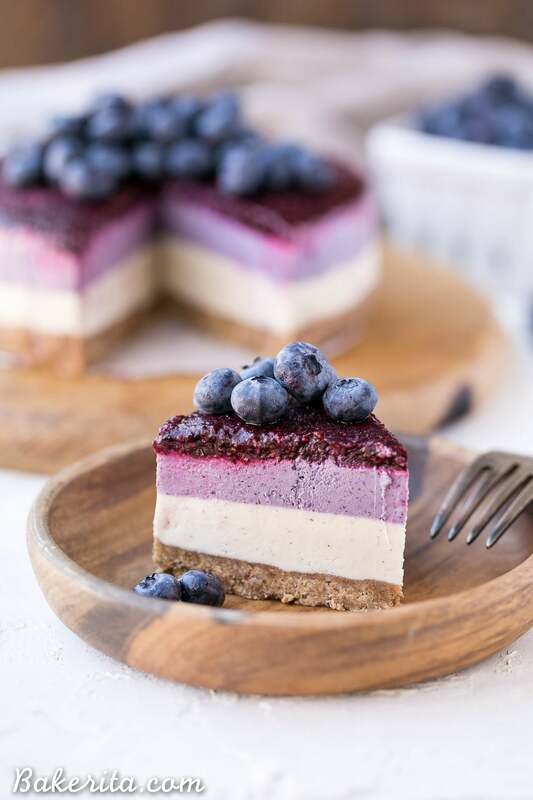 Looking at the pictures of this no-bake layered blueberry cheesecake makes me seriously giddy inside! Isn’t she a beauty?! I’m pretty sure no-bake, raw vegan cheesecakes are my new favorite thing. The love affair began when I realized how beautiful and photogenic they can be after photographing this raspberry one for my friend Monica over at The Movement Menu, and then this citrus-topped lemon cheesecake stunner. I think this blueberry version is my favorite though – so far, at least :) not only is it sooo pretty with those layers, but it tastes ridiculously good. Like my other raw cheesecakes, this one is made with CASHEWS as the base! If you’re skeptical about cashews’ ability to replace luxuriously creamy cream cheese, you wouldn’t be the first. I was skeptical for a while…until I tried it. Once soaked for 8 hours, the cashews get incredibly soft and creamy, so they very easily blend into the most luxurious, creamy filling you can imagine. Paired with full-fat canned coconut milk, a bit of coconut oil, maple syrup, lemon juice, and vanilla, it makes a pretty damn close replica of the cheesecake you know and love. 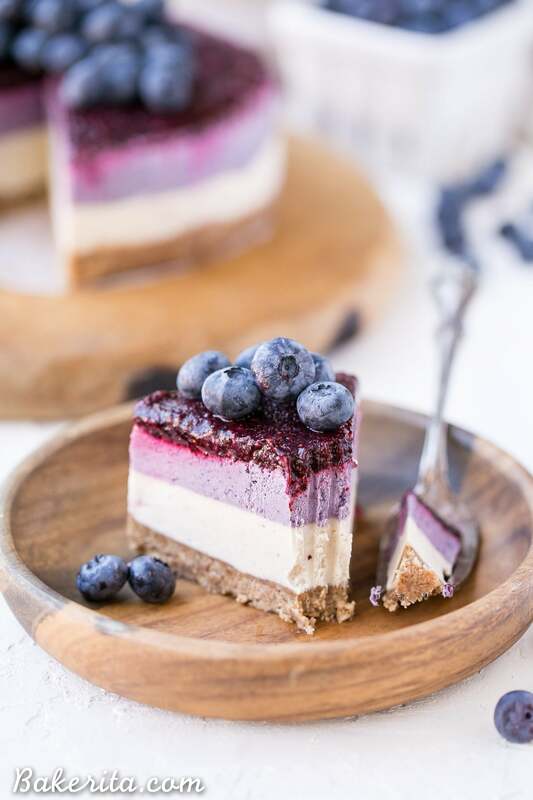 This one takes away all those refined sugars and the dairy though and makes a “cheesecake” that will actually fill you up and give you some nutrients. Such a win! 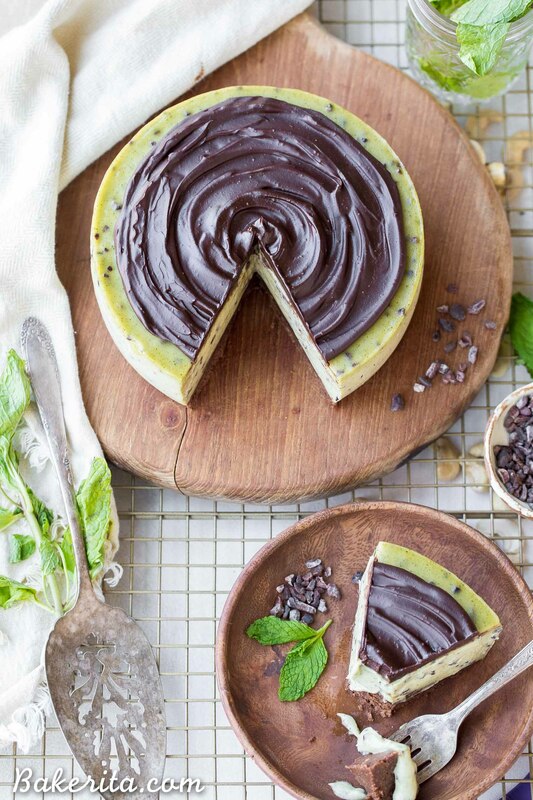 This vegan and paleo cheesecake will certainly satisfy that cheesecake craving. Once you’ve blended up the creamy cashew filling, half of it gets poured over the date-based crust. The crust is lightly sweet, chewy, and crunchy, with a hint of cinnamon. It works super well with the vanilla and blueberry flavors! The other half of the filling has freeze-dried blueberries blended right into it, which give it that gorgeous blue color and a mellow blueberry flavor. Freeze-dried blueberries are DIFFERENT from dried or frozen blueberries. They’ve had the moisture removed from them, so they add flavor and color, but they don’t add any extra moisture. It’s important you use freeze-dried blueberries, otherwise, the flavor won’t be as strong and the texture will be off. 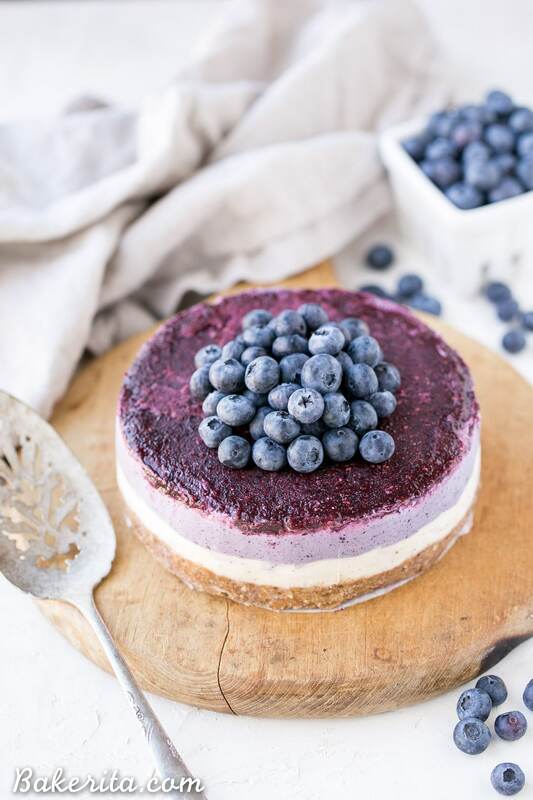 The freeze-dried blueberry paleo cheesecake layer is spread on top of the first creamy vanilla layer, and then it all goes into the freezer to harden up while you make the final layer. The top blueberry layer adds the final touch – a burst of tart blueberry flavor that helps brighten up the richness of the cashew-based layers. There’s no sweetener, just blueberries blended with a touch of lemon juice and some chia seeds to help thicken it up. The layered blueberry cheesecake is kept in the freezer, but you’ll want to let it thaw for 10-20 minutes before serving. That way, you can slice into it super easy and it’ll be perfectly luscious and creamy when you serve it. 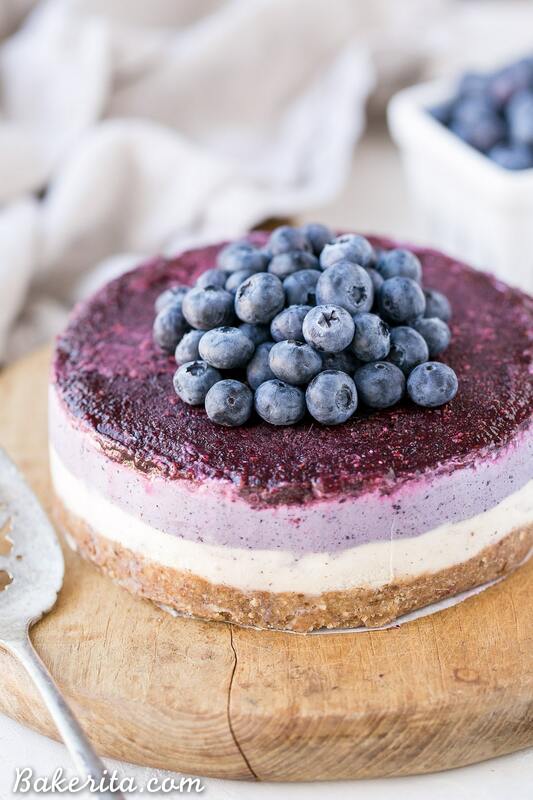 This no-bake layered blueberry cheesecake is definitely going to be a new favorite around here. 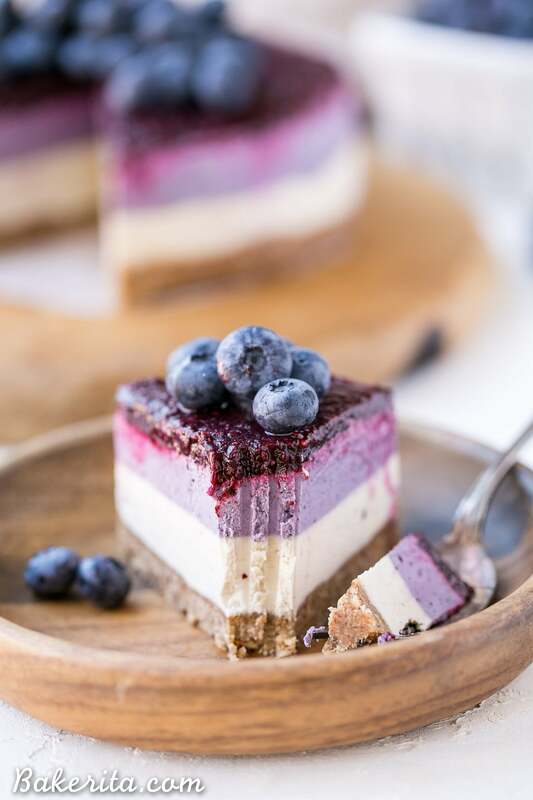 It’s hard to resist the rich and creamy cheesecake layers, especially with that tangy blueberry topping and the intense blueberry flavor. It’s also perfect because if you’re not serving a crowd you can store any leftovers in the freezer for a while – blueberry cheesecake on demand is always a win! 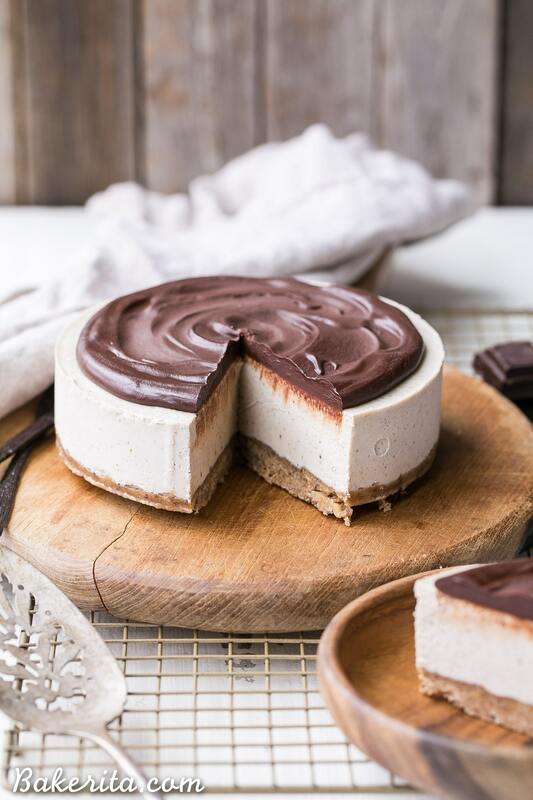 Enjoy :) and if you like this recipe, be sure to scroll past the recipe below for some suggestions on even MORE delicious vegan and paleo cheesecake recipes. 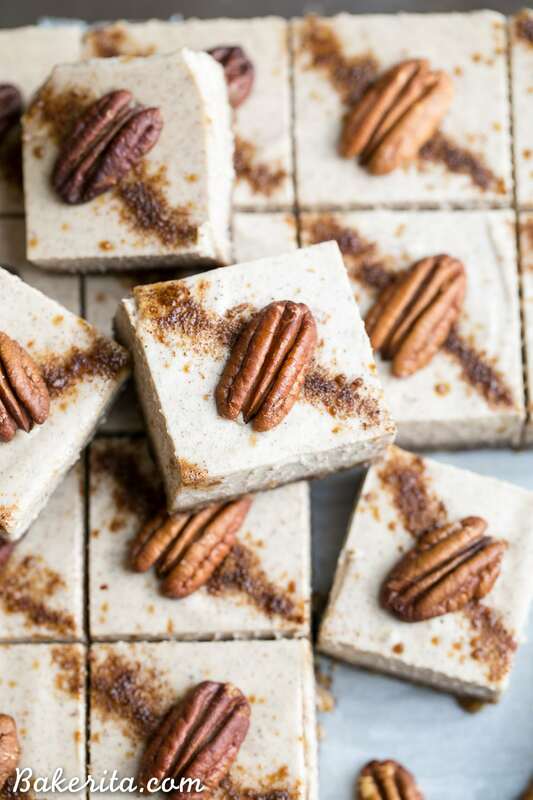 Add the pecans, almond flour, pitted dates, coconut oil, cinnamon and salt to a food processor or high-powered blender and pulverize until it comes together into a sort of sticky dough, with small pecan bits remaining. Don’t over process, or it’ll turn into nut butter! Press the pecan date dough evenly along the bottom of the prepared pan. In the same food processor or high-powered blender (no need to wash between - I used my Vitamix, but most powerful blenders should do the job), combine all of the filling ingredients except for the freeze dried blueberries and blend for about 2 minutes, or until the mixture is silky smooth and creamy. Scrape down the sides as necessary. You may need to add a bit more coconut milk or lemon juice to get it to blend smoothly if your blender isn’t super high-powered. Once it’s smooth, taste the mixture and adjust the sweetness/tartness levels by adding more maple syrup, vanilla, or lemon juice, if desired. Pour 2/3 of the filling into the prepared pan over the pecan crust. Smooth out the top and tap the pan hard against the counter a few times to release any air bubbles. Place in the freezer. Add the freeze dried blueberries to the remaining batter and blend to incorporate. Spread over the plain layer. Return to the freezer. Rinse out the blender, and add the fresh blueberries, lemon juice and chia seeds to it. Blend until smooth, and then pour over the other layers. Place in the freezer to set for at least 3 hours or until completely firm before slicing and serving. I recommend running your knife under hot water to warm it up before cutting the cheesecake with the still-hot (dried) knife. Serve frozen or let them thaw at room temperature for 10-15 minutes before serving. Store in the freezer for up to 2 weeks. Want more vegan and paleo cheesecake recipes?! This cheesecake is absolutely gorgeous, Rachel! I don’t blame you for loving raw cheesecakes. I’m in love with that pretty blueberry layer. Such deliciousness, and much needed for Friday. I bet this tastes SO good! Wish I could share a slice with you, Gayle! Thanks so much for the love. What are the calorie and carb counts for this? I would LOVE to try it. Hi Denise, I just added nutritional info to the recipe so you can see it now! I remember seeing this on Insta and was all heart eyes with the color, layers and that it’s made of cashews! A win-win for sure! Now, I have cashew milk on the daily, make cashew ice cream and use them to whip up chia pudding but I’ve never made a cashew cheese cake. I’ve been gawking for a few years, but just need to give it a go! This cake may have just pushed me over the edge. Thank you for sharing this creative recipe. Gorgeous work, Rachel! I’m sure you could come up with one seriously gorgeous and delicious cashew cheesecake, Traci! I want you to make one just so I can see what you come up with :) thanks so much for all your kind words and love! Rachel, this cake is way to gorgeous to even eat. I would just want to stare at it all day. Then devour it after dinner. Beautiful! You’re too kind! Thanks so much Megan. Tastes too good to just look at! ;) Thanks so much Kevin. What a stunner, Rachel. I make cashew-based berry cheesecakes regularly but I always have to use so much extra coconut oil or cacao butter to accommodate for the liquid in the berries. Using freeze-dried fruit is the perfect solution! Where can I get freeze dried blueberries? I get mine at Trader Joe’s, but most grocery stores carry them these days! I’ve affiliate linked to where you can order them on Amazon above in the recipe. Hope you enjoy, TJ! Can I use just regular dried blueberries ? Hi Amanda, the regular dried blueberries won’t break down into a powder the way the freeze dried berries do so it won’t have the same effect, unfortunately. I had the same issue. Couldn’t find freeze dried blueberries anywhere. I used a small handful of fresh blueberries to replace them and it worked wonderfully! Thanks for the helpful response, Kayla! So glad that worked for you, hope you enjoyed it! This is funny, because I just developed a blueberry-rosemary cashew cheesecake a couple of days ago! I meant to layer it, but ended up accidentally throwing the blueberries in the blender right off. :P I also prefer baking my cashew cheesecakes – I add some liquid and arrowroot starch and bake at 350* for about twenty minutes. This sounds amazing. I am a cheesecake fiend. But I know that the sugar is evil. Did you know that cashews can help fight depression? Now with your version of cashew cheesecake, we’re really talking comfort food. I can’t wait to try it! I’m not a baker, so one question. Are you using raw cashews? Thanks so much Krista! I did not know that cashews fight depression – that’s super interesting. Yes, I am using raw cashews – thanks for asking that, I updated the recipe to reflect it. Thank you. I’m putting this on next weekend’s calendar. I’m looking forward to following you . . . .
Those layers are insanely gorgeous! This Cheesecake looks like spring and I have been craving all things berries with the weather change! Can’t wait to get into the kitchen and make this one! Thanks so much Laurel! Hope that you love it. This cheesecake is so pretty, I just love those layers! I have to say you make a stunning cheesecake! I’ve never made one before, and never eaten a vegan/paleo cheesecake, but I can’t help but want to after seeing this post. I do have a couple questions re substitutions I’d like to ask. First, the almond flour in the crust, can I substitute almond meal instead? Second, could I substitute the maple syrup–either with honey or agave syrup? I’d love any advice you have to offer! Hi Julie – thank you so very much! You can definitely use almond meal in the crust, and you could sub either honey or agave for the maple syrup, whichever has a flavor you prefer :) I hope you enjoy your first foray into vegan/paleo cheesecake! Thanks for the speedy response. One more thing I forgot to ask. soaking the cashews… is that done using water? Hot/cold? Sorry for all the questions, but I just want to make sure I do it right. I totally understand, Julie! Thanks for asking – I just updated the recipe to be more helpful. I soak in cold water overnight, but you can also use hot and soak for less time. That won’t be quite as creamy as the longer soak, but it will still work. Hope this helps!! I made this today (albeit with a couple of changes) and I’m blown away with how tasty it was. Bravo! Ms. Bakerita, you deserve one hell of a pat on the back for this recipe. The texture was so reminiscent of a cheesecake, and I will admit that I was skeptical of the cashews up until i took my first bite. I decided to add a couple tsp of gelatin to the cheesecake batter (I’m sorry for perverting your vegan recipe) to make it more stable. It worked like a charm and it was delicious! thank you so much. I can’t wait to make it again, but next time I’ll top it with lime curd (the flavor would go wonderfully with the coconut). Hi Julie, I’m SO glad you enjoyed it!! Adding gelatin is definitely a good way to help it keep it’s shape at lower textures if you’re not vegan :) adding lime curd on top sounds like it would be fantastic – wonderful idea. Thanks so much for your feedback Julie! The colors in this cheesecake are just so amazing I’m sure it tastes as good as it looks! Thank you so much Pamela!! That is such a perfect-looking slice, Rachel! I’m SWOONING over all those gorgeous layers! The most perfect spring cheesecake EVER! How did I miss this?!?! It’s so pretty. I need to make myself some raw cheesecakes….only I’m afraid I won’t have the self control to stop at just one slice. These are so pretty!!! Love the colors!! Wow…what a creative and beautiful dessert, Rachel! It sounds amazing, and it would be such a showstopper for a holiday! Thank you so very much, Blair! Hi, is there another dairy free milk that would work without cake tasting like coconut? Also, what kind of pan did u use? Hi Shayla – you could probably use any kind of non-dairy milk, but I’ve only tried it with canned coconut milk which is thicker than most others so I’m not 100% sure on how it would turn out. It doesn’t have a strong coconut flavor at all though. I used a 6″ pan, I’ve linked to it below the recipe. Thank you, I’m going to try this once I purchase some cashews. You don’t boil the cashews (that would make them mushy), just place the cashews in a bowl and pour the water over them, then let them sit in the hot water for an hour. Hope this helps! Thank you for this amazing recipe!! I made this today, very first time ever making something vegan but wow was it a success! Yes I will admit that I was a bit skeptical when it came to the cashews, I wasn’t sure what I was walking into, and I was caught off guard a bit as I had to double the ingredients last minute as I realized my springform pan was twice the size of your 6″ cake, therefore I soaked 2 cups overnight and it turned out very creamy (wow) , now since I had to double all of the ingredients as I have a 12″ springform pan I did end up using a the hot/boiling water over one hour method for a second batch of cashews, you are right it does the job but it’s definitely not as good as soaking them over night, I found it was much more nuttier than the overnight version and I added a little more sweetener (maple syrup) to mask the nutty flavour. I will also admit it is very hard to find freeze dried blueberries in Ontario, Canada so I used 2 cups of frozen blueberries (slightly thawed), and it still gave the cake a beautiful purple Color, not to mention that nice kick of blueberry, I also didn’t have chia seeds so I simply puree’d 2 cups of blueberries with 2 tablespoons of honey, this gave the cake a perfect sweet and tart flavour. My family is not much for change, and definitely were skeptical about having a vegan dessert but with there being 9 people at my Easter dinner and every single person having seconds I think it was a success (haha) everyone very much enjoyed the cashews creaminess and it turns out that the second layer of cashew that was nutty was a blessing as they enjoyed the kick of nuttiness that they tasted (though I would still prefer to soak overnight and I recommend to anyone else who makes the recipe-it just makes for a much creamier dessert which is heavenly) . I was pleasantly surprised by how perfect this dessert was and how well it turned out because of my lack of proper ingredients, you have designed a perfect cake and thank you! This was the life of my Easter dinner! Hi Jessica, I’m SO thrilled to hear that you loved it! Sounds like you did a great job adapting it, and I’m so happy that it was a hit during Easter! I appreciate all of your feedback and kind words. Good to know it works with frozen blueberries, too. Thanks so much! Could you use strawberries instead of blueberries? Hi Liz, you definitely could! That would be delicious. Enjoy! Made it yesterday and it tasted good! So glad you enjoyed it, Inge! Hi! I’m hoping to make this for my daughters 2nd bday as we have lots of food allergies so its hard to find something very special with ingredients we can have- one question is whether you think I could substitute something else for the almond flour as we can’t do almonds? Ground pecans, perhaps? Hi Emily, you can definitely just use ground pecans in place of the almond flour in the crust. So glad you found a recipe you can all have, I hope it’s a hit! This looks Devine! Going to make this tomorrow for a special birthday…Will light coconut milk make a difference? Also, if I wanted to use a 9inch spring form do you know what the measurements would be? Hi Meredith, full fat coconut milk sets up better but light will likely be fine. For a 9-inch pan, I’d 1.5x the recipe, or even double it to make sure it’s thick enough. Enjoy! Whoops, that should say soaked in cold water! Fixing it now. Hope you love the recipe, Amy! Do you happen to know how many calories it has? Hi Jennifer, you can insert the recipe link here: myfitnesspal.com/recipe_parser to calculate the nutritional information. I made this beautiful cheesecake tonight for a celebration on september 9th! Store in the freezer for up to 2 weeks.!!!! What happens if it is 2 weeks plus 6 days stored in the freezer? Will it still be good??? Hi Julia! It will definitely be fine for those extra six days – the two weeks are just a guideline, but I’ve had similar cheesecakes stay good in the freezer for longer. I hope it’s a hit! Hi Marina, are you vegan? If not, you could use honey in place of the dates. You could also try using another dried fruit, like apricots or another sticky dried fruit (rehydrate in hot water if necessary). This recipe looks devine, just bought everything but can’t find almond flour in any stores nearby – i have regular flour, rice flour, corn flour, or chestnut flour, do you think one of these could do? looking forward to doing this tomorrow! Hi Camille, if you have almonds or another kind of nut you like, that would work better than regular flours since it’s not baked and you don’t want a gritty texture. Just pulse the nuts in your food processor or blender to break them up before adding the rest of the ingredients. Enjoy! worked brilliantly, thank you! made this with frozen rasberries, everyone loved it! So thrilled to hear they were a hit! Thanks for your feedback Camille. Is the vanilla essential? I’m out of town and don’t have any on hand. Maybe just add more lemon? Also, can I sub almonds for pecans for the crust? You can definitely use almonds instead of pecans for the crust. You can skip the vanilla, it shouldn’t be too huge of a deal. Taste it after blending and add more lemon if you think it needs a little more flavor. I’m planning on doing this recipe but I brought aa 10 inch pan instead of the 6 inch oops would I still be able to do, I’m sure i can but was wondering should I just double the measurements? Hi Cassie, yup I’d recommend doubling the ingredients for a 10 inch pan. Enjoy! Thank you for this recipe both presentation and taste turned out very good!!! I am in love with the colour!! I did use walnuts intead of pecans. I didn’t have walnuts everything else in there is exactly the same. Thank you!! So thrilled to hear you’re enjoying it, thanks for your feedback Monique! Just did a double batch and split it into 2 muffin tins for 24 individual cakes. Subbed citric acid powder for the lemon juice 1/2 teaspoon plus 1/8 teaspoon per 2 tablespoons of lemon juice. If these turn out like I think they will my boss will be incredibly happy, as will I. Thanks for helping do some next level food science! I hope they’re a hit, Jared! Thanks for your feedback – I’d love to hear how the citric acid powder works. What other oil can you use that would be heart healthy? Can I use peanut or olive? Coconut oil helps the cheesecake to set and keep it’s shape, you’d be better off just leaving it out then subbing with a liquid oil! Hi! Super excited about this recipe- I have a vegan friend and my last attempt at making raw vegan was not a great success. This is probably a silly question- but do I just discard the water I used to soak the cashews in? can you use fresh blueberries? Im making it for christmas and there in season right now? this will be awesome for my sister as she has P.C.O.S and has a difficult diet to stick to. Hi Rachael, it won’t be as vibrant or flavorful with fresh blueberries since the freeze dried blueberries are more concentrated…it also might make the texture different. You certainly could do it, though! Hi. Going to make the cheesecake this weekend. I am not vegan and not very keen on using coconut oil. Can I use butter instead? Hi Aditi, you could, but I’m not sure how it will taste since this recipe was developed using coconut oil. Try at your own risk! So thrilled to hear it was a hit! The mango on top sounds delicious. Thanks so much for your feedback, Anita. Hi Bridgette, I’ve had success with a number of different brands. Thai Kitchen is always a good one for coconut milk, and I like Nutiva for coconut oil, though. Would love to try this! Anyway you can share the ingredients in grams? I made your cheesecake last night- It turned out pretty good!! Definitely room for improvement but everyone at the party was in love. I skipped the dried blueberries and just made two layers. I used a 12inch cake pan and doubled the recipe and it turned out great! Hi Daniela – thanks for your feedback, I’m glad you enjoyed it. I’m curious what you think could’ve used some improvement? The freeze-dried blueberries add a ton of flavor to this cake, so that could’ve been what you were missing out on. I’m so excited to try this recipe next week for our family dinner! My husband is sensitive to chia seeds (makes him bloat), is there a chance I can substitute it for something else? We’re not vegans, I just use a lot of vegan dessert recipes for my mother in law who hates whole eggs. Also, can I substitute maple syrup for splenda or stevia? Since my in laws are both diabetic I want to try as much as I can to reduce all forms of sugar. Any help would be appreciated! Hi Mardy, I hope you guys love it!! You can just skip the chia seeds – just know the top layer will melt into the others when it’s not frozen a little bit quicker, which just affects looks. I don’t use stevia or splenda or any sweeteners like that, so you’d have to just add them to taste while you’re making the filling. Hope this helps! Thank you for this beautiful and delicious recipe! Note to makers: I doubled the recipe and used a 9″ spring form, which resulted in a height of about 3.5″. This does not sustain well outside the refrigerator for much longer than 20 minutes. I made it for an event and it slumped dramatically while on display. Anyone with experience with coconut milk/oil could have seen that coming but hope springs eternal… It still tasted great, just more like a cream pudding. It would be lovely as such in glasses, maybe with the nut mix on top or with a cookie. I will definitely make it again with that note in mind! Thanks for sharing your helpful tips, Chloe! Love the idea of doing it in glasses if you’re planning on leaving it out for a long period of time. Appreciate your feedback, and so glad you enjoyed it. Hi, I made this recipe today and I must have done something wrong as the vanilla layer wasn’t very pleasant. It has a nutty / bland taste. I did soak the cashews overnight and used every recipe as mentioned. Could it be that I’m not blending my cashews enough? Or do I maybe need to add more of the maple syrup to sweeten It up? How creamy is it supposed to be? Hi Rana, it should be very creamy with no chunks at all – it should be totally smooth and silky. If you’re used to sweeter desserts, you might want to add more maple syrup to taste, as mentioned in the 4th step. Without being in the kitchen with you, it’s hard for me to know exactly what went wrong, but hopefully, that helps you figure it out! Let me know if you have any other questions. Made this cake today for my son’s 2nd birthday. My first try and it turned out to be perfect! It’s very creamy and delicious. Much better (and healthier) than a regular cheesecake. You have any idea why the purple layer turned out to be brown instead? I used dried freeze blueberries and everything as instructed.. Thank you for an amazing recipe! Hi Katja, so glad you enjoyed the recipe!! How odd that it turned brown, were the freeze-dried blueberries normal colored? I usually use the ones from Trader Joe’s or Natierra Superfoods and it’s always been a nice color. Not sure why that would be different for you. Wish I could see it too! If you post on Instagram, tag me so I can see :) thanks for sharing your feedback! Love your cheesecake layer! I hope i could find your recipe sooner. So I made this yesterday for my son’s 1st birthday and I must say we absolutely love it! My 1 year old was stuffing his face with this cake. I’m so glad I found this recipe, I feel better for giving him this cake. So thrilled to hear it was a hit for your son’s birthday – so glad he enjoyed it :) thanks so much for sharing your feedback, Monica! I love this recipe and I would like to try it this week. I have a quick question about it. We live in Serbia so unfortunately there are no freeze-dried fruits around here to purchase. I do have in my freezer a lot of blueberries, that are in the NO FROST section of my freezer so they have no extra-frost except for the water that the fruits naturally have inside them. Would that be ok ? Is there a procedure for me to follow prior to adding them to the recipe ? Also there are no fresh blueberries here available at this moment, for the topping. We do have fresh blackberries and/or raspberries though. You think I could use those as a topping ? Or would this change the flavor too much ? Thanks so much in advance for your help ! Hi Mihai! I haven’t tried this recipe with frozen blueberries, but you may want to cook them down a bit before using (create almost a jam by cooking them over the stove to make that extra water evaporate) or I fear it might make things a little watery. Feel free to follow up if you want more guidance on this! You can definitely use the fresh berries you have on hand for this cheesecake, or alternatively, you can just use fresh blackberries or raspberries in the filling (no need to cook down first) and for the topping, if you like those flavors! :) Hope this helps! Your receipe looks delicious! I would like to make it, but feel nervous because I had made a similar recipe and I had problems with the cheese cake batter curdling. The batter was the same as your recipe, cashews, coconut oil and milk, lemon juice…. What could have been the problem? Could it be that I didn’t shake my coconut milk before adding to the food processor? Or did I beat the batter for too long?? Hi Ivy, I’m not sure since it doesn’t sound like you used my recipe and I can only speak for my recipes, of which I’ve never had that problem. Nothing should curdle in there and no one has ever told me that it has. If you blend long enough, it should be super creamy, smooth and thick – definitely not curdled. Hope you’ll try the recipe and won’t be dissuaded by the results you had with someone else’s. Good luck! Thanks Rachel for your reply! Hey, do we need to soak the chia seeds at all before use? Absolutely loved this recipe ! It was easy to make and it turned out delicious . I’m very late to the party, but I’m curious as to whether this recipe freezes well? I’d like to make it in advance for Xmas. If it is freeze-able, do you have any tips on thawing? Hi Santie, it freezes perfectly! Just wrap it up tightly in plastic wrap and/or a plastic zip bag so it’s not exposed to the freezer air to freezer burn. Hope this helps – enjoy! Hi Felicity, I’d start with about 1-2 tablespoons, taste, and add more from there. It just needs to be firm enough so the top feels hard to the touch. Takes a a half hour or so in my freezer. Hi Neerja, either will work, but if you want a super clean division between the layers you can freeze for a little while between them! What can I use instead of almond flour? My daughter is allergic to almonds. I need to use a GF flour. I just made this cheesecake for tomorrow’s New Year party and can’t wait to try it. It was very easy to follow! One question. What would you recommend to use instead of cashews? No almonds because of allergies. It came out splendidly! Thanks so much! It was a surprise bday cake for my boyfriend’s mother. She’s a vegan and didn’t even dream of a bday cake (Romania is not the best place to be vegan). She was thrilled…wish I could add some photos here. Thank you so much! Hi Linda, yes it’s only 6 inches! It’s super rich because of the cashew base. You can always double it and put it in an 8″ pan if you’re worried about it not being enough, but I’ve never heard that complaint! It definitely serves more than 2 to 4 – you’d be VERY full if you ate half of it! I am so in love with your recipes, they are beyond fantastic! So you think this could become a mango cheesecake if we replace blueberries with mango? I have been looking for a vegan mango cheesecake and this recipe looks delicious! Thank you so much! Hi Irina! Thanks for the kind words – so thrilled you enjoy my recipes. I think you could definitely convert this into a mango cheesecake! I’ve actually experimented with that before and using freeze-dried mangos didn’t give me the bold mango flavor I was looking for. You may want to try using about 1/2 of a super ripe & sweet mango instead of the freeze-dried mangos for the best flavor :) I’d taste after adding 1/2 the mango, and you can always add more for a bolder flavor. Enjoy!! I’d like to know, please, how long this can be kept out of the fridge. I would like to make it to take to a dinner at my vegan daughter’s house. If I remove from freezer and place in portable chiller for approx 2 hours travel, will it all turn to mush? I’m planning on making this for a dinner party this weekend. A 6 inch tin is quite small, right? Have you ever doubled the quantities and made in a bigger tin? 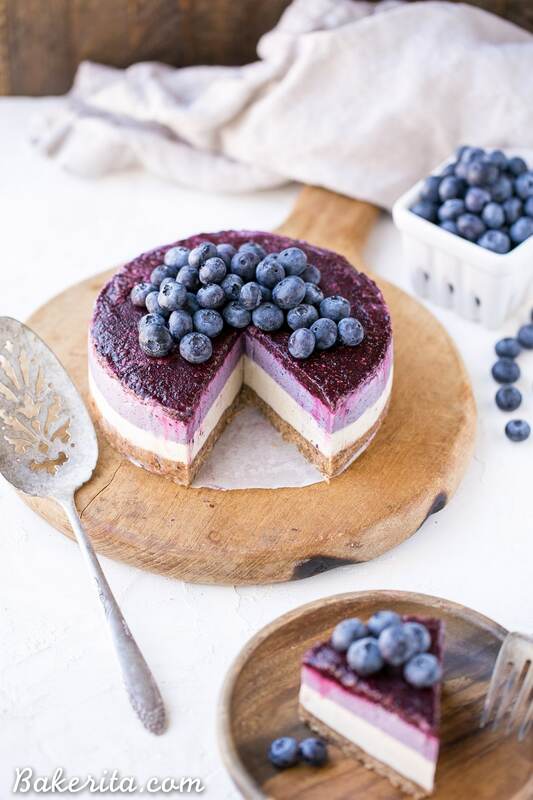 Hi I am currently making this, how long do I set the cheescake in the freezer before I pour the other blueberry third layer on to it? then how long to set overall? Hi Keely, you let it chill until the layer below is firm, usually around an hour. It’s about three hours to set overall. This will depend on the conditions of your freezer. So thrilled you’re loving it, Anita!! I’ve just put it in the freezer. The colours are so nice, can’t wait to try it out :) Due to coconut oil, would it be possible to store the cake in the fridge after 3 hours freezing time? I’d serve it tomorrow and the day after and it’d be difficult to get only two slices out of the form. What do you think? Hi Timea, you can definitely keep it stored in the refrigerator. Enjoy!